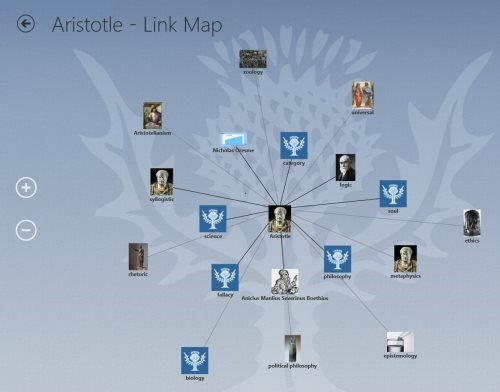 Encyclopedia Britannica app for Windows 8 lets you read articles about almost everything, covering the entire world. 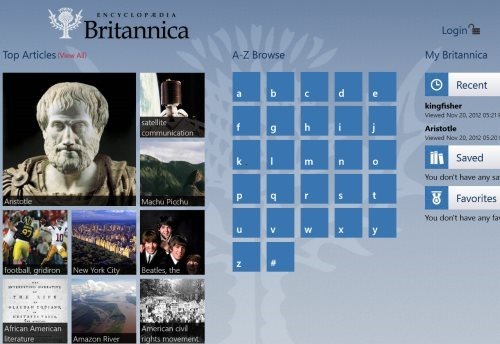 More than 80,000 articles have been included in this Windows 8 Encyclopedia Britannica app. You can easily perform searches using the large Search Bar given on the home page of the app. In addition, the app also brings you Top Articles category that consists of top hundred articles for you to read. There is also a ‘This Day’ section that brings you content related to the Event happened in the past on this day along with famous people born on this day. Apart from using the Search Bar, you can also browse through all the AtoZ categories and read whatever you find interesting. Also, there is a section where you will find all the recently read articles, saved articles for offline read, or view all your favorite articles. Yup.. you can easily save an article to read it while you are not connected to the internet or just add an article to your favorite list so that you can complete reading it, in case you have read it just a part of it. Lets you search for any topic and read articles on them. Lets you access top hundred articles of the day. Lets you access events happened on this day and read about famous people born on this day. Lets you use Link Map section. Comes up with a featured article of the day. Brings you a ‘Did You Know’ section consisting of new words everyday. Lets you save an article for offline reading. Lets you change the font size, view images related to the currently opened article. Lets you add an article to ‘Favorite’ list for future reading. Well.. I really liked this Encyclopedia Britannica Windows 8 app. Right from its beautiful column-based interface to the quality of content, to the ‘Tis Day’ section, to saving articles, to its favorite section, to images, diagrams, to recently viewed articles section, to A-Z browsing, just everything. It’s a must-have app. Also, check out post on Social Networking Apps, RSS Reader, PDF Reader. Open this given link in IE10 and click on ‘View in Windows Store’. Soon the app will get opened in the store itself. Now, you can proceed further with its installation. In short, Encyclopedia Britannica app for Windows 8 is a good utility app that provides you information in large area about almost all the topics. Go ahead and download it now..